Making the decision to place your loved one in a senior assisted living facility is never easy. It takes hours of weighing the pros and cons and of choosing the right facility. Once all of this is done, it is very important to start communicating with your loved one about everything so that they are not taken by surprise. 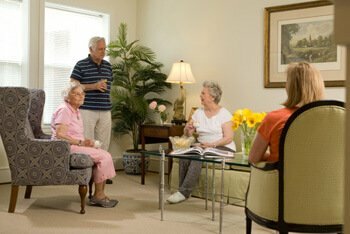 If you are worried about the process of moving your loved one into an assisted living facility, we have a few suggestions that can make the process easier for you and for your loved one. When speaking with your loved one about the facility, be sure to focus on all of the benefits that assisted living can provide. Tell them about all of the activities they will be able to do, all of the new people they will meet, and how well cared for they will be. This can be a very important step, so letting them know about all of the good things they can expect is vital to make them feel comfortable with the idea of a facility. You want to always make the experience feel like a whole family affair. This will put your loved one at ease and will even make them look forward to going to the facility. One of the best things you can do is help them pack. Making this a fun experience that the two of you can share will help them adjust to the idea of moving. If possible, get a floorplan of the senior assisted living facility. Your loved one will probably feel anxious about the kind of place you have chosen, so having a map to show them can actually be a good idea. If the place has a website with photos, be sure to show it to your loved one, pointing out how beautiful the location is, how large the space is, and all of the things they will have a chance to do. If you have gone to visit the facility on your own, it can also be a good idea to take pictures so that you have something to show them. Once your loved one has moved into the facility, be sure to add touches to their rooms which are familiar. Bring things from their home which they love and turn the space into as homey a room as possible. This will help with the transition and will ensure that your loved one is happy in their new location. All of these suggestions can make your loved one transition much more easily and happily into assisted care. A center like Morning Star Senior Living can help with all of the preparations and can ensure that your loved one feels welcome from the very beginning. By speaking with your loved one and showing them images and even the floorplan of the facility, you will see just how much they will start looking forward to moving.